PITTSBURGH - June 27, 2017 - PRLog -- . Today, the UIE bands are thought  caused by stochastically heated cosmic dust upon the absorption of single UV photons from hot stars having temperatures > 10,000 K, the dust comprising silicate and carbonaceous NPs < 100 nm that permeate the ISM. UIE stands for unidentified infrared emissions, NPs for nanoparticles, and ISM for interstellar medium. The UIE bands in the IR comprising 3.3, 6.2,7.7–7.9, 8.6, 11.3, and 12.7 μm correspond to the molecular vibrations of carbon, hydrogen, and oxygen atoms in the NPs. Currently, the UIE are believed  carried by NPs comprising PAH molecules and larger MAONS. PAH stands for polycyclic aromatic hydrocarbons and MAONS for mixed aromatic/aliphatic organic nanoparticles. The interstellar IR spectra is based on the absorption of a single UV photon by a PAH or MAON as consecutive absorption of UV photons by the same NP in the emptiness of the ISM is extremely unlikely. Based on classical physics, the NP is assumed [3,4] to have heat capacity allowing the absorbed UV photon to produce transient temperatures up to 1000 K, the thermal emission of which creating the observed IR spectra including the UIE bands. QM governs NPs – not classical physics. QM stands for quantum mechanics. By the Planck law of QM, NPs of PAH and MAONS because of their nanometer size have vanishing heat capacity and can only conserve a single UV photon by an infinite temperature jump - a physical impossibility, and therefore the UIE bands observed in IR spectra can have nothing to do with thermal emission. Unable to conserve UV photons by thermal emission, the UIE bands are excited by nonthermal QED induced fluorescence in NPs. QED stands for quantum electrodynamics, but is a simple form of the complex light-matter interaction proposed by Feynman and others. In simple QED, the NPs upon absorbing single UV including VIS photons from the ISM create EM energy within the NP that is lowered by radiationless processes to excite the UIE bands. But even single near IR photons absorbed by a NP may be induced by QED to excite far IR UIE bands. 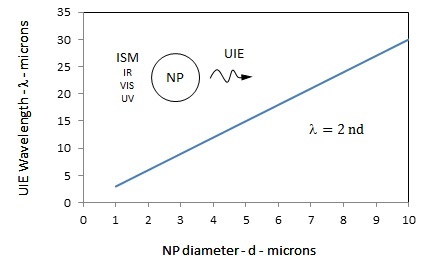 Because of the high surface to volume ratios of NPs, the EM energy of the absorbed single IR,VIS or UV photons is confined to the NP surface, but QM precludes an increase in NP temperature. With the surface heat providing EM confinement of NP atoms, simple QED conserves the surface heat by creating EM radiation standing across the diameter d of NP having half-wavelength λ/2 = d. The EM radiation created has Planck energy E = hν. Here, h is Planck's constant and ν is frequency, ν = (c/n) / λ = c/2nd, where the velocity of light c is corrected for the slower speed in the solid state by the refractive index n of the NP. Depending on the NP diameter, the Planck energy E excites UIE bands at λ = 2 nd by fluorescence. Since the NP surface heat is spent in forming the standing EM radiation, the EM confinement no longer exists and the UIE bands are emitted into the ISM. See diverse simple QED applications of the Planck law at the nanoscale at http://www.nanoqed.org/, 2010 – 2017. QED radiation inducing NPs heated by single IR,VIS, or UV photons from the ISM to excite the UIE bands by fluorescence is illustrated in the thumbnail. Consider a NP of diameter d = 3.7 μm of silicate having n = 1.5 and a NP resonance λ = 2nd = 11.1 μm. Since the ISM photon energy cannot be less than that required to create a standing wave in the NP, only a single ISM photon having higher energy and wavelength λ < 11.1 μm may be absorbed, e.g., in the UV by a Lyman - α photon at 0.121 μm or in the VIS by a red photon at 0.7 μm or in the near IR at 0.9 μm, all wavelengths of which are redshift to fit inside the 11.1 μm diameter NP. By fluorescence, the 11.3 and 12.7 μm UIE bands are excited and emitted to the ISM where they may be absorbed in other NPs > 11.1 μm to excite UIE bands at 12.7 μm and other UIE bands in the far IR. QM by the Planck law precludes the excitation of UIE bands formation by stochastic heating of NPs to high temperatures. Instead, the UIE bands are excited by nonthermal fluorescence of single IR, VIS, and UV photons absorbed in NPs of cosmic dust. UIE emission spectra of cosmic dust does depend on the molecular composition of the NPs, e.g., PAH or MAONS. But the ISM absorption spectra does not. Rather, the absorption spectra of dust depends on the distribution of Planck energy of the dust NPs. Typically, NPs having Planck energy E = hc/2nd absorb in the UV or even the EUV. Specifically, the 0.22 μm bump in the UV absorption spectra corresponds to silica NPs having an average diameter 0.0733 μm, but increases significantly into the EUV for the smaller NPs. Stochastic heating based on classical physics that assumes NPs have heat capacity is not applicable to NPs. Moreover, thermal heat loss by the Stefan-Boltzmann law valid for macroscopic particles should be superseded for NPs by nonthermal QED induced EM radiation. A. Li, et al., " The carriers of the unidentified infrared emission features: Clues from polycyclic aromatic hydrocarbons with aliphatic side groups," New Astron. Reviews 77, 1–22, 2017. S. Kwok, et al., "Unidentified Infrared Emission bands: PAHs or MAONs?,"Phys. Chem. Chem. Phys., 16, 17551, 2014. E. M. Purcell, "Temperature fluctuations in very small interstellar grains," Astrophys. J., vol. 206, pp. 685, 1976. B. T. Draine and A. Li, "Infrared emission from interstellar dust. I. Stochastic heating of small grains," Astrophys. J., vol. 551, pp. 807, 2001.